I hate chocolate chip cookies. Those small chunks of chocolate embedded in the cookie are essentially the turn-off for me, and I find myself looking for oatmeal raisin cookies instead. So every time I am offered a chocolate chip cookie my response is usually a semi-exaggerated "Yuk!" Well, that was until a few days ago. It so happens that once in a while, in order to get to my home in Brooklyn, I have to take the 2 or the 3 train running on the Broadway line. That means walking one block east along 74th Street towards Amsterdam. Now about two buildings before you reach Amsterdam there is a small, nondescript bakery on the north side of 74th. A small sign about 8 x 8 inches hangs just over the entrance to the bakery. One has to walk down about six steps from the street level through a narrow doorway in order to enter it. On almost every occasion that I have passed by that bakery there would be a line of customers on the sidewalk waiting to get in. 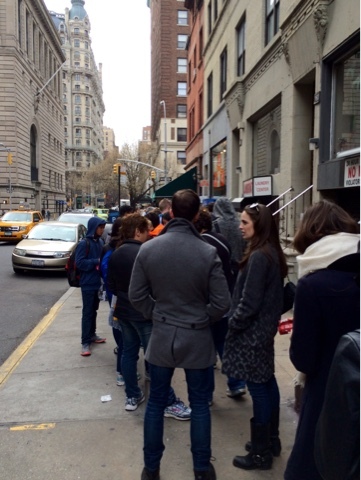 I noticed a strange thing recently; the line of customers just seems to be getting longer and longer and longer. What was the draw, I wondered. As luck would have it, I was passing by the bakery a couple of days ago and noted to my surprise that there was no line of customers waiting outside. This was my chance - an opportunity to find out what enticingly, sirenic baked goods were responsible for luring such large crowds as I have seen on that sidewalk. 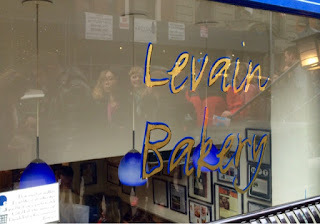 Fearful that a line of people might suddenly materialize out of thin air, I rushed down the steps and into the bakery. It was as small inside as it appeared outside. I looked at the offerings available in the glass case. There were muffins, scones, and cookies - both chocolate chip and oatmeal raisin. They looked not unlike the baked goods I have seen elsewhere, so I wondered to myself whether this wasn't just a case of the emperor having no clothes. I overheard one of the attendants saying to a customer that one of the offerings was very popular with patrons. I looked down at that to which he was referring and thought to myself, "No!" He seemed to have looked in the direction of the chocolate chip cookie, but I wasn't sure. In fact, I refused to believe that the chocolate chip cookie might be responsible for the crowd that often gathered outside that bakery. I disliked chocolate chip cookies, remember? 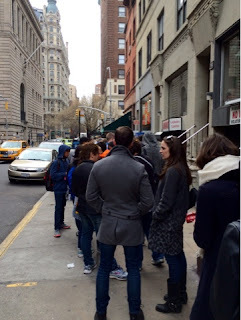 When the attendant came to me I asked him to explain to me what drew the crowd to this bakery. He pointed to the chocolate chip walnut cookie. It couldn't be!!! Well, it was, indeed!!! Dejected, I told him that I would take one, adding that it had better be good. He told me to return and let him know what I thought, and I promised him I would. I ran some errands around the city and then decided to head home. It took me about two hours to do the errands and to travel to my home in Brooklyn. Once I got off the train, I dove into the paper bag containing the cookie and broke off a half. I took a look at the half I had broken off and gasped. Was I seeing right? There were no small chocolate chunks embedded in the cookie. Instead, there were a few layers of fluid chocolate above a few layers of walnut. I could not believe my eyes. This was certainly not that to which I was accustomed. I took a bite of the cookie, and I kid you not; the thing was still a bit warm. After just over two hours!? Unbelievable. But oh my God! The taste! The taste of the darned thing was incredible. Once I tasted that cookie, I concluded at that point that every other chocolate chip cookie was a mere footnote to the one sold by the bakery, and I had now become a lover of chocolate chip cookies - at least this chocolate chip cookie. 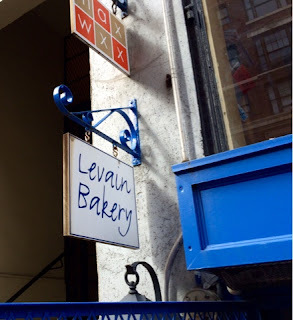 So, if you ever happen to be in Manhattan and you are desirous of some out-of-this-world chocolate chip cookies, check out Levain Bakery at the corner of W 74th Street and Amsterdam Avenue. They certainly make the best chocolate chip cookies.